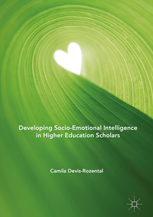 This book explores the impact of socio-emotional intelligence on wellbeing in higher education. Stemming from years of investigation and educational expertise with trainee teachers and academics, the book identifies ways in which socio-emotional intelligence can be developed in university environments. The author begins by analysing the concept of socio-emotional intelligence and its development, before confronting distinctive areas for improvement within the context of teaching and learning in higher education.